Hi all, I'm in the trial period and want to test the software for Tibia MC. I play in OT servers, and I'm trying to configure a game profile in Innerspace. I selected the .exe of the OT server, but when I click in the profile in the system tray, it doesn't launcher the game at all, even the first window (the Tibia.exe of the OT have a mutex, but I'm using XenoMC to chance the close the mutex). Can someone assist me in configuring this profile? I really liked the software, and would be a must to play in a ot with 4-8 characters. Can I do this while using ISBoxer? Can I launch the game manually for each slot to inject the bot before opening the second client? 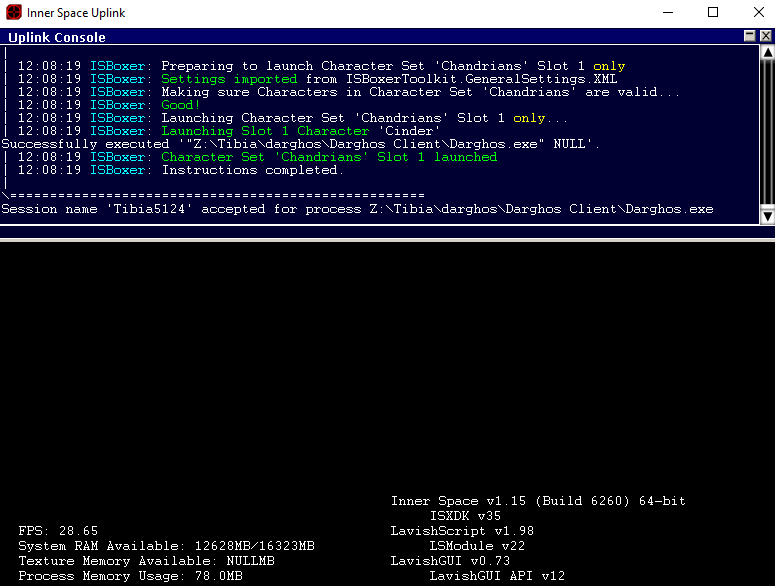 Update, the console shows that the instructions are sent, but no windows are created and the game doesn't launch. I tried others softwares like Octupus, and there I got a error that octupus tried to open tibia.exe in a temp folder but was missing the tibia.dat file. I moved that file to Octupus directory and it worked. Do innerspace create temporary folders with the client .exes? Can I set to move that tibia.dat file together? Devs? Any feedback if IsBoxer works with Tibia 8.6, Tibia 10, Tibia 11? Any response would be appreciated before my evaluation time expires. I've not yet had a chance to check on this, but will see what I can find out. If you're on trial, you can of course have additional trial time if we fix it. Tibia's BattleEye system prevents the game from working with Inner Space. As with other systems similar to BattleEye that are listed next to games on our wiki (http://isboxer.com/wiki/Supported_Games) I am going to have to call this one a no. Sorry! I believe that you are using the official client that have BattleEye. I play on OT servers, that are servers non-official, where the client are past version and doesn't have BattleEye. I play on this server: http://onixserver.com.br. They use two clients, one Tibia version 10, and another version 11. I'm trying to use on the version 10. I was able to launch via InnerSpace, but the ISBoxer isn't creating the zones that I config in the layout. I've had a bit of a search and cannot find a statement from CipSoft indicating that non-official servers are OK to run. We tend to try and support game publishers, and not spend time making ISBoxer work on non-official versions, unless they are endorsed by the publisher, or it is well known that the publisher has abandoned the game and sufficient time has passed to indicate it will stay that way. I did find on the OT Wiki the following quote. Some information in this article or section describes a violation of official Tibia rules. Using this information improperly may result in a banishment from Tibia, or even an account deletion. TibiaWiki does not in any way condone the violation of Tibia rules, and cannot be held responsible for the abuse of information that is available on this site. OT WIKI wrote: Open Tibia (Servers), often abbreviated as OT or OTS are Tibia game servers not hosted by CipSoft GmbH and are using open source technology created from scratch. They are illegal by the rules of Tibia and connecting to them using Cipsoft's Tibia client is illegal by law, however the Open Tibia servers can be legally used. The implication of what they do not say, is that the server can be used, as long as you do not connect using the CipSoft produced Tibia client, past or present. There is OT servers that uses the OT Client (an open source client). I play in one of those servers and will try the ISBoxer with it. The feature that I need to work really is the Zone Swap thing. Where in my main monitor stays one fullscreen windows while the second monitor shows windowed versions of secondary clients and that I can swap. Those others features like broadcast and advanced things I'm not interested. My need is a windows management, and only that. I don't know if ISBoxer will supply this need, but would want to know if there is a program that uses the innerspace for only that.